Mad Men is finally back! I've been waiting so patiently for the new season to start and I can't believe they've been off the air for more than a year! I missed them! 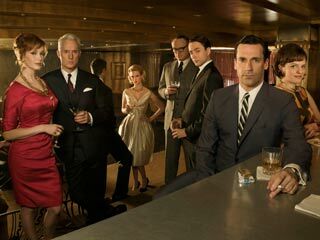 While waiting for this new season I've gotten my Mad Men fix by watching other movies with cast members in it, like Bridesmaids where Jon Hamm is such a d**k, but then again, he's not the sweetest guy on Mad Men either. And I've watched Drive, where Christina Hendricks has a tiny part where she say maybe three sentences total and ends up pretty bad afterwards. But I digress. Tomorrow, Sunday is the day. Two full hours! Another thing I don't have is cable TV. I've done away with cable after my baby was born, because I always thought that cable charges were ridiculous (paying for a million channels I don't watch) and I didn't want my daughter growing up watching a lot of TV (except now she watches a lot of iPad!). Cable TV would cost me at least $70 per month, times 3 months of Mad Men, it would total $210. But guess what? iTunes sells the whole Season 5 for $33 in HD! And if you don't care about High Definition, the whole season in SD is less than $25! Totally worth it! Another show for me to watch!